We want to promote aviation organizations (including charities and community service projects) that are providing opportunities for people to "move forward by doing for others." We begin with two of the country's leading aviation charities, WINGS FOUNDATION, INC, assisting American Airlines Flight Attendants, and CAUSE FOUNDATION, assisting United Airlines Flight Attendants. Do you know of an aviation charity that would benefit from greater exposure? Click here to tell us. Once we qualify the charity/community service project, we'll post the link. The LeRoy W. Homer Jr. Foundation encourages and supports young men and women who wish to pursue aviation careers, as professional pilots. This 501(c)(3) charity organization was created through the leadership of Cathie Ong in honor of her sister, Betty Ong, who died on Flight 11. The group is currently working on a 9/11/06 5K run event. The Kiwi Club is an organization for former and current American Airlines flight attendants. A 50 plus-year-old charity, the Kiwi Club based supports worthwhile causes (including WINGS) with chapter fund raising efforts. Read this about The Kiwi Club. A 33-day bike ride across America "to bring about a public awareness of the sacrifices of the flight crews on 9/11, sustain their memory and ensure they will not be forgotten." Created in Nov. 2001, the 9/11 Flight Crew Memorial Foundation has designed and is planning to construct a memorial in the DFW area. 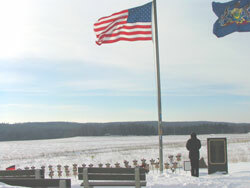 Check out www.911flightcrewmemorial.org for pictures and more information. The group, spearheaded by Dean Thompson, is working to raise funds to dedicate the Memorial on the 5th anniversary of 9/11. Read A/A Flight Attendant Valerie Thompson's Tribute. Airline Ambassadors is comprised of 4500 volunteer airline and non-airline members who volunteer worldwide assisting children and humanity in need. Founded by AA FA Nancy Rivard, it is the only NGO of its kind. The Beacon Foundation is a nonprofit organization that was created to assist NWA Flight Attendants. Established in April of 2000, the Foundation's mission is to provide financial assistance to NWA Flight Attendants and their families who are suffering from a critical or terminal illness, injury, or disability. Snowball Express is designed to provide hope and new memories to the children and spouses of military fallen heroes. The genesis for giving these families these experiences was created as a result of a Southwest Airlines flight over 10 years ago and has now resulted in over 2500 children and spouses attending the event over the last two years. American Airlines is the Official Airline of Snowball Express.